There are 56 rivers that flow down from the Himalayan kingdom of Bhutan to the eastern state of Assam in India to meet the Brahmaputra River. The hills of Bhutan are covered with lush forests, but on the Indian side of the border there are vast tracts of dry plains with occasional patches of severely denuded forests. Not very long ago the forests were contiguous across the borders but internal migration, poverty and increasing demand for fuelwood changed the landscape drastically on the Indian side of the border. A large share of Bhutan’s revenue comes from hydropower projects, although it has been declining over the years, from44.6% in 2001 to 20% in 2013. Most of these hydropower projects have been developed in cooperation with India. Bhutan currently has an installed hydropower capacity of 1,488 MW, although it hopes to increase this to 20,000 MW. Due to climate change all the rivers flowing from Bhutan to India have changed their behaviour dramatically in the last decade – with long periods of dryness, shallow flow and then repeated flash floods, followed by massive amount of silt, sand, sediments, stones and boulders hurtling downstream across the border into India, constantly altering the river’s course. This has caused hardships and misery to people on both sides of border. Downstream communities in Assam have regularly raised the alarm, attributing these changes to dam building upstream in Bhutan. They are worried that the plans to build more dams in Bhutan will lead to more flooding, erosion and more destruction than good. The Bhutanese government and their Indian dam consultants have dismissed these objections in the past, but the recent erratic weather patterns have upset all predictions and is now shaping the future flow of the river and Bhutan’s relationship with India. The inhabitants of the India-Bhutan border are among the poorest of the region. 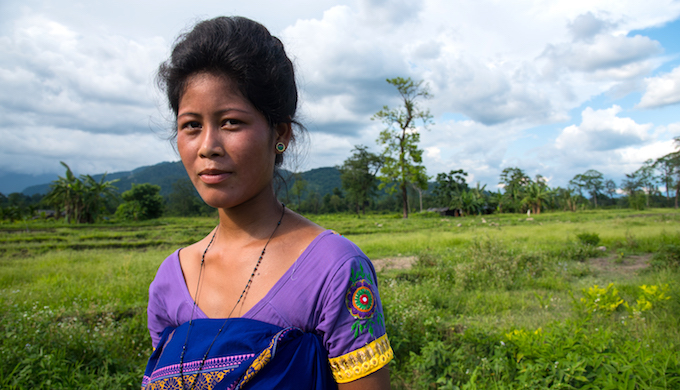 The mostly tribal population is recovering from intermittent periods of ethnic conflict and armed clashes in Assam that has displaced over 400,000 people since 1996. Mass exodus and internal migration have affected employment, land rights and traditional occupations. As a result returning families depend heavily on natural resources for their livelihoods. Some 70% of the region’s population is food and energy deficient. The flash floods in Bhutan’s Sarpang district in 2016 wreaked havoc in downstream areas in Assam’s Kokrajhar and Chirang districts, with the excessive silt turning large tracts of farmland into desert. The silt flow was so huge that the hundreds of farmers in Patgaon, located and close to National Highway 31, still cannot cultivate rice even now. On July 21, 2017, when the Sarpang River broke its banks again, the town of Sarpang Bazar was entirely washed away by floodwater, cutting the border town of Gelephu off from the road. Fifty-two families were left homeless after continuous heavy rainfall. Floodwaters and landslides cut off the highway from Phuentsholing on the Bhutan-India border, and landslides brought down power transmission lines, leaving many parts of Bhutan without electricity. The department of roads reported that nine gewogs (districts) were totally cut off. After the flash floods, Bhutan tried to divert the river away from human settlements to mitigate the damage and also gave permission to stone miners to retrieve and sell stones and boulders from the dried up riverbed, causing much consternation amongst local farmers who were concerned that these activities will increase the current and flow of silt in the river. Another controversial measure taken by the Bhutan government was to embargo the building of a nine foot tall check dam in the middle of the river, traditionally built and maintained by Indian farmers to divert the water through the Jamfwiaka dongs(irrigation channels) to their villages. Without water from the Jamfwi check dams, the farmers downstream cannot irrigate their crops. This caused much concern and consternation among downstream communities. Any changes in the river, its flow, its course and its siltation adversely affects farmers. Upstream damming and increased landslides in the mountains have changed once perennial sources of water into dry rivulets in winter. Without irrigation, most farmers are unable to cultivate their land. Women have to go long distances to fetch water for their homes. The Saralbhanga River (also called Swrmanga) flows from Sarphang district of Bhutan to Assam in India. About 500 farmers from five villages close to the border contribute to building, repairing and maintaining this check dam on the river, a traditional diversion based irrigation system of the Bodo tribe, which is called the Dong or Jamfwi system. Jamfwi or Dong irrigation system water channels fed by the Sarlabhanga river is the traditional system used for irrigation in Korkrajhar district. The Jamfwi or Dongo irrigation system channels water across the border into India through a labyrinth of small canals to irrigate rice and vegetable farms. 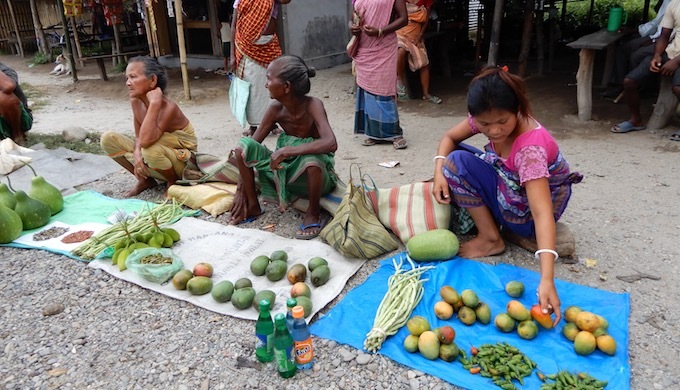 Communities on both sides of the India-Bhutan border consume the produce. Anarsingh Iswari, a leader of the Akhand Buryogari Bandh Committee in Navnagar, in Assam grows paddy, black dal and ginger using the traditional irrigation system. When the Bhutan government put an embargo on building of check dams, Anarsingh and Raju Kumar Narzary, executive director of the Northeast Research and Social Work Networking (NERSWN), a Kokrajhar-based NGO and members of All Bodo Students Union, Bodo Women’s Forum for Peace and Development, met the officials of the Bhutan India Friendship Association (BIFA) to raise the concerns of the farmers. The BIFA officials facilitated an urgent meeting with the deputy commissioner of Sarphang district of Bhutan and after understanding the plight of the farmers, the Bhutanese officials agreed to allow the farmers to continue to build check dams and also decided to help the farmers divert the water of Saralbhanga River for irrigation purposes, which they have been doing for centuries. This has given huge relief to at least 5,000 farmers. For 18-year-old Azlka Musahary, a student who helps her family on their farm, this has come as great relief, mainly because she has to walk a shorter distance to collect water for their household needs. Longer conversations with women of the Saralpara village reveal how central the Jamfwi or Dongo irrigation system is to the survival of the villagers. At the community level, women participate in all decision-making around the amount of water to be lifted for each household and the contribution to the maintenance of the irrigation system. It is the women who have the most at stake and are the ones who want a more permanent solution, a treaty between the two countries if possible, so that there a better conversation about water flow on both sides of the border. “Water issues in river basins are becoming more and more complex and far reaching at all levels — local, regional, and national. The story of conflict resolution on Saralbhanga River is a great example of successful people to people engagement supported by administration on both sides,” Animesh Prakash of Oxfam India toldthethirdpole.net. Prakash is in Oxfam’s Transboundary Rivers of South Asia (TROSA) project, which aims to contribute to poverty reduction and to reduce marginalisation of vulnerable river basin communities. The project plans to do this through increased community access to and control over riverine water resources. “We need to build on the foundation set by the students union and civil society on both sides of the border with continued strategic engagement to promote collective actions to mitigate and adapt to the climate change induced havoc playing out in these parts of western Assam. Peace is essential for implementation of any poverty alleviation and development programme in the region,” Prakash added. Clearly, this successful interaction has led to growing interest among local civil society organisations to participate in processes and influence practices at all levels in integrated water resource management and ensure they are more inclusive of community concerns.